January 29, 2015 at 6 p.m. In 2011, the police in Rhodes (Greece) contacted the Dodecanese State Archive concerning the discovery in a basement of a large collection of Italian documents. In November 2013, a team of scholars identified the records as the archive of the Carabinieri's Central Special Bureau, a political police that, between 1932 and 1945, collected information on individuals, businesses, ethnic groups, spies, important events, and political personalities. The records, which were thought to be lost, had remained for 66 years in the room where the Carabinieri had left them in 1945. 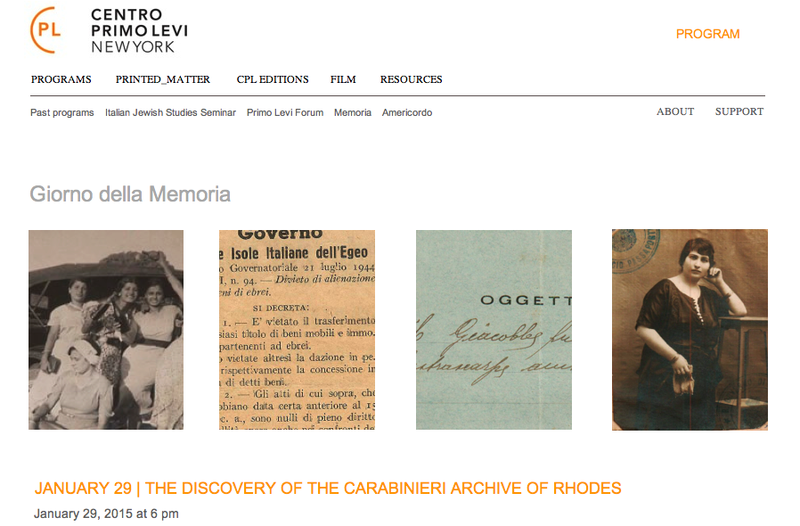 A large number of these 100,000 files concern the local Jewish community in Rhodes, following the creation of the central governing body of the Italian Jewish communities (UCII) in 1931, to the deportation of July 1944. Their story can now be re-examined under new light based on much broader evidence of their interactions with the Italian authorities. The documents of the Central Special Bureau are currently being catalogued and digitized by the Greek State Archives with the support of the United States Holocaust Memorial Museum.